Antarctica is one of the most amazing places I have ever visited, and cannot believe the beauty and serenity of this wonderful continent. 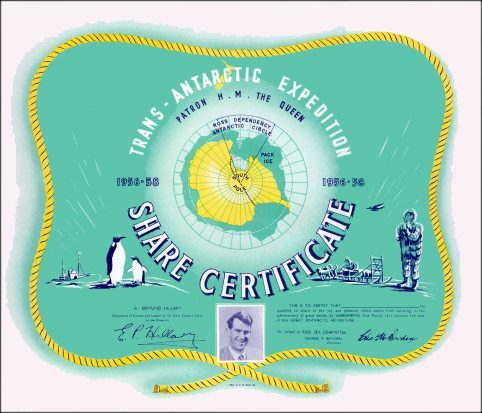 Scripophily.com ®, the Internet’s largest buyer and seller of collectible stock and bond certificates, is offering an original Trans - Antarctica Expedition Share Certificate which was printed in 1958. This historic document has an ornate border around it with a vignette of penguins and explorers, and a picture of Sir Edmund Hillary. This item is over 55 years old. This certificate has the printed signature of Sir Edmund Hillary as Conqueror of Mt. Everest and leader of the New Zealand Party to the Antarctic, and Charles M. Bowden, Chairman of the Ross Sea Committee. This original certificate was given to contributors who helped finance the legendary Trans-Antarctic Expedition (1955-58) which made the first successful overland crossing of the continent. In commemoration of the achievements of Sir Edmund Hillary and other Antarctica explorers, Bob Kerstein, Founder of Scripophily.com, traveled to Antarctica in February 2013 to promote Scripophily.com’s offering of this historic document. 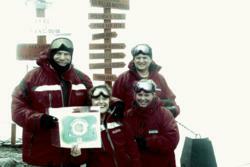 He and associates were photographed with the document in front of Base Brown, Paradise Bay, Antarctica. “Antarctica is one of the most amazing places I have ever visited, and cannot believe the beauty and serenity of this wonderful continent” said Bob Kerstein after his visit. “The Trans - Antarctica Expedition Share Certificate is a wonderful piece of Antarctic history and we are happy to offer these historic documents on our website. We owe a lot to these early Antarctic explorers and could only imagine the hardships they encountered in their explorations.” Kerstein added. Certificates are collected and given as gifts because of their historical significance, beauty and artwork, autographs, notoriety, as well as many other factors. The supply of new certificates reaching the collector market has been substantially reduced due to changes in state laws and stock exchanges rules. Many companies are no longer required to issue physical stock and bond certificates, a process called “dematerialization”. Scripophily (scrip-ah-fil-ly) is the name of the hobby of collecting old stock and bond certificates. Values range from a few dollars to more than $500,000 for the most unique and rare. Tens of thousands of Scripophily buyers worldwide include casual collectors, corporate archives, museums and serious collectors. Scripophily.com - The Gift of History is the internet’s leading buyer and seller of collectible stock and bond certificates and has items on loan for display in the Smithsonian’s Museum of Financial History in New York. The company has been featured on CNBC, USA Today, Associated Press, Reuters, Nightline, Today Show, Baltimore Sun, and Washington Post and in many other media publications. The company also offers an old stock research service at OldCompany.com and offers high resolution scans for publications. Scripophily.com has over 17,500 selections on its website. Scripophily.com / Old Company Research Service is the successor company to all material published by the Marvyn Scudders Manuals, the Robert D. Fisher Manuals, and the Herzog & Co., Inc. obsolete research services, which have been performed continuously since 1880. We are the leading provider of authentic stock certificates, autographs, and old company stock research services. Scripophily.com and Old Company Research Services was founded by Internet Pioneer, Bob Kerstein (Bob.com). Bob is a CPA and CGMA, and has more than 37 years of senior management experience in the Cellular, Cable TV, Satellite, Internet, Professional Sports and Entertainment Industries. Bob is also the President of the Professional Scripophily Traders Association (PSTA). For more information on Scripophily.com®, visit http://www.scripophily.com, http://www.scripophily.net, http://www.bob.com or call 1-703-787-3552.